Much as I might love to sink my teeth into a tender cob of corn, I like it even better sheared from the cob and made into a summer salad. But the process of stripping corn from cobs often results in a colossal mess. Never again. 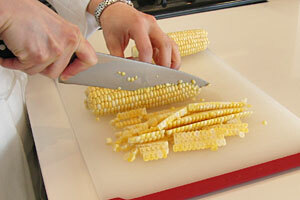 Here’s a tip for how to cut corn off the cob I picked up from Cooking Light that keeps your mess to a minimum. 1. Get out a Bundt or angel food cake pan. 2. Invert the tip of a shucked ear of corn into the center of the pan. 3. Hold the ear firmly at the top, and run a knife down the side to shear off the kernels. I prefer a serrated edge knife for this. 4. Work your way around the cob, allowing the cake pan to collect the kernels as they drop. I was cutting corn off the cob in a similar fashion for years until I saw a chef simply lay the corn on its side and cut it off that way. It is easy enough and doesn’t require anything other than a cutting board and a knife. It was a total AH HA moment. Well that looks awfully simple! I will have to give that a go as well. Thanks for the link! How happy are we that it’s corn season?! Love this tip! Great tip! And those 3 corn recipes all look delish! How have I never seen this tip before?! You need to submit to Deanna and Serena’s Kitchen Hacks over at Teaspoon of Spice! 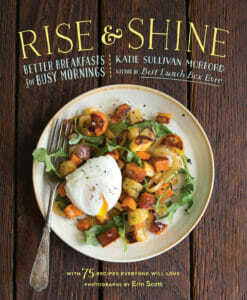 I could have used this tonight before making a huge mess making my corn and tomato salad! So happy it is fresh corn season! I have made the biggest mess – juice hitting my glasses and the entire counter, lol! I’ll try it this way!